At least four people were killed Tuesday morning in a terror attack at a synagogue in Jerusalem, according to Magen David Adom. Eight other people were reported wounded, including four in serious condition, two in moderate condition and two who sustained light wounds. Two police officers were among the wounded. “We are viewing this as a terrorist attack,” police spokesman Micky Rosenfeld said. 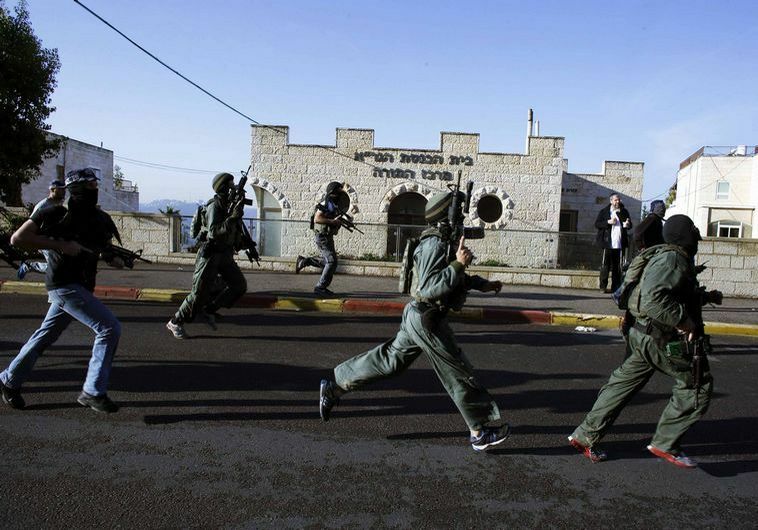 According to police, the two suspected Palestinian terrorists, armed with a gun and axes, attacked worshipers after entering a synagogue on Agasi Street in the capital’s Har Nof neighborhood. Two police officers quickly arrived to the scene and exchanged fire with the suspects, killing them. Both suspects were from east Jerusalem. Large numbers of police and emergency teams were at the site. Medical workers evacuated three seriously injured people and one lightly wounded to Hadassah University Medical Center – Ein Kerem, MDA said. Meanwhile, Shaare Zedek Medical Center in the capital was treating one seriously wounded person and one moderately hurt. “There were roughly 30 people in the synagogue and the terrorists attacked then with axes, knives and pistols,” said Rosenfeld. “Police responded quickly and killed the terrorists in a gun fight that left both officers injured, one critically. We have a forensics team in the synagogue now,” the police spokesman said. Rosenfeld added that heightened security has been implemented throughout the capital. MDA paramedic Betzalel Ben Hemo arrived at the scene of the attack and began treating the victims. “We found a man outside, fully conscious, with three gunshot wounds, he told The Jerusalem Post. “We evacuated him from the scene, and asked him to breath slowly,” he said. The gunshot wound victim managed to tell Ben Hemo that there are no more terrorists active in the area. “We rushed him to the Sha’arei Tzedek Medical Center,” the paramedic said. “Unfortunately, we have recently been getting used to these scenes, which remind us of past terror attacks. They are returning with full force,” he added. The attack marks the latest incident in a flare of violence that has surged over the past few weeks in Jerusalem.